Trying to date vintage Shalimar and navigating eBay to find a bottle of the version that you prefer might seem, at first glance, to be an exhausting, frustrating, and complicated ordeal. However, there are some basic guidelines to make things much simpler. It’s one of those things where the learning curve is initially steep but then, suddenly, it becomes much easier and one can (almost) whip through the many eBay listings to single out the bottles which fit your precise parameters. So, today, we’ll spend quite a bit of time on the bottle designs for vintage Shalimar, their history, their appearance, their packaging, their differences, and the methods used to try to date the bottles. The analysis will focus almost entirely on the parfum, but I’ll briefly mention the bottle designs for the other concentrations that were discussed in Part II. They’re not hard to date or figure out for the most part but it’s a different story for the parfum, particularly since most eBay sellers don’t know much about the bottles that they’re selling. I recently had to use a sort of reverse engineering or backwards analysis based on nothing more than the height dimensions (inches) of a listed bottle in order to figure out its size and possible date of release. And I’m still not sure of the latter! The process is much like playing Sherlock Holmes except, in this case, the tiny clues often don’t yield definitive answers. I want to emphasize that I’m not an expert on dating Shalimar bottles, but I’ll go over the basics and the factors that I personally use or look at when trying to decide which bottle to buy. “Dating” can be an extremely technical, arcane, and overwhelming process at first and I found it quite confusing myself when I started out, so I’m going to try to make things as simple as possible by using as many photos as possible to show the small differences between bottles. 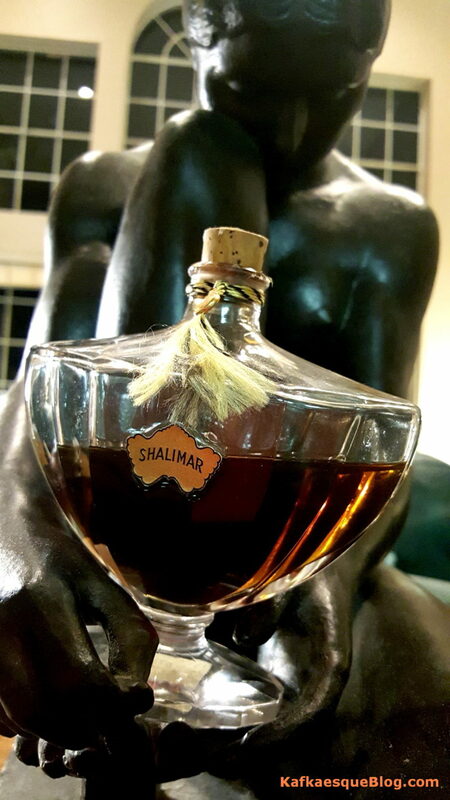 I’ll also provide you with links to various guides or articles that go through the minutiae and specifics of the many types of Shalimar bottles over the decades for you to read on your own time. In addition, I’ll share a few of the tips that I’ve picked up for navigating eBay listings and finding hidden gems, sometimes for a more affordable price than expected. Before I start, I want to underline once again something that I said in Part I: there is a lot of guesswork involved when trying to date anything much earlier than 1976 which is roughly when Guerlain began using codes on its bottles and boxes. Unless you luck out and find a seller who was the original purchaser of the bottle, their relative who knows the history of the bottle, or someone with incontrovertible and specific evidence (like a receipt with the date of purchase, for example), then you can never know with absolute certainty if a bottle dates to, say, the 1950s, the 1960s, or any other decade prior to the 1970s. Shalimar “Rosebud” or “Amphora” bottle, said to be 1950s. Photo: Angelaira’s Vintage Perfumes blog spot. For the most part, when it comes to the very old bottles of vintage Shalimar, one is basically using deductive reasoning to draw imprecise inferences and conclusions from wholly circumstantial evidence. So, if you’re hoping for a “hard and fast,” set rule on dating, there isn’t one. If someone tells you with categorical certainty that their bottle dates to a specific year or decade, pre-1970s, and they’re not someone who falls into the categories that I’ve listed above, then I think they’re fooling themselves. Most of the time, there are just estimates and guesses in this area. Guerlain had many different bottle designs, particularly for the parfum (like the “urn, “rosebud,” or “umbrella” bottles) and each one was in use for several decades, but I know of no Guerlain fragrance of any kind that came with batch codes prior to 1976. So, my tips or pointers are, like everyone else’s tips and pointers, merely rough guidelines. With that word of caution, let’s move onto the specifics. 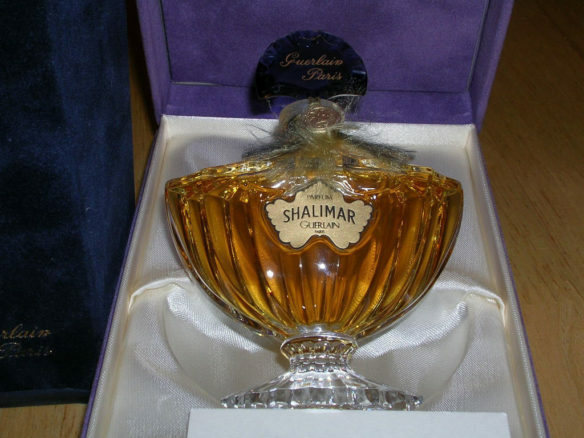 Vintage Shalimar parfum in the “bat” or “urn” shape. Far left and left, 2 oz Baccarat crystal bottles. Then, 1970s 1 oz bottle that looks like regular glass. Far right, a 3/4 oz 1970s bottle that is said to be “Baccarat” as well. Photo: my own. The situation with Cristal Romesnil and Pochet et du Courval is interesting. 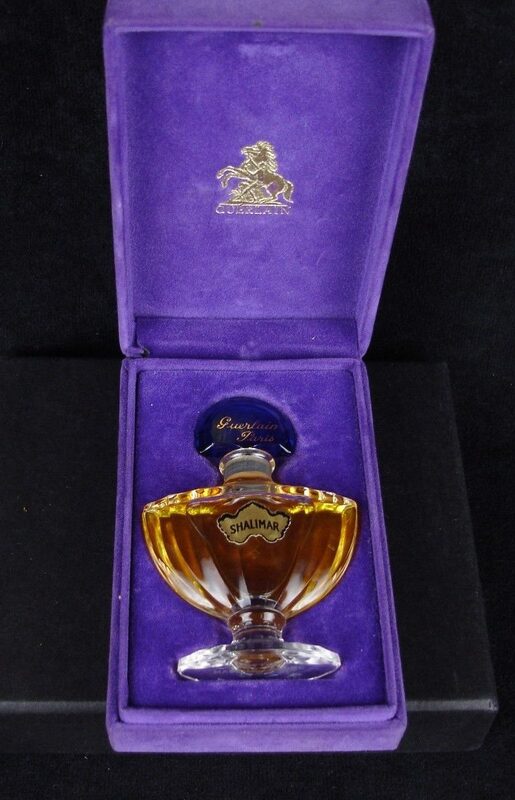 I’ve read that Cristal Romesnil made some Shalimar “bat” parfum bottles as early as the 1920s, but I can’t say that I’ve come across anything they’ve made at any point except for one bottle of Mitsouko parfum that bore their “CR” log on the bottom and that the eBay seller said her grandfather bought in Cuba in the 1940s. I certainly haven’t seen any Shalimar bottle bearing a sign that it was made by CR. I have no doubt that they exist, but they’re not common enough for me to have seen them. The Pochet ones seem, comparatively speaking, to be more common, and I think I may have come across a few of their “bat” bottles, usually from things that are estimated to be 1960s or 1970s in age. 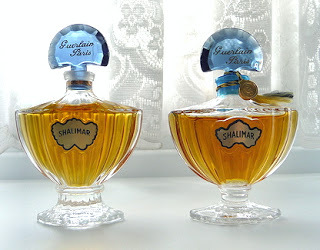 After looking at numerous bottles from various decades for both Shalimar and other Guerlain fragrances, I have a few thoughts and impressions but, in all candour, I don’t know how accurate they are. I have the sense that Pochet and CR made the greatest number of their bottles from the 1950s onwards. Not just for Shalimar, but for a number of the Guerlain parfums. I also have the sense that they made bottles more often for Shalimar’s non-“bat” shapes in those years. (I’ll talk about those other bottles in a moment.) Finally, the few bottles that I have seen from the two companies (again, in shapes other than the “bat” or the “urn”) look like they have very different glass than bottles manufactured by Baccarat. Vintage Shalimar, 4.2 oz Baccarat bottle, date uncertain. Photo & bottle: my own. To my eye, none of them look like heavy crystal in the way that the Baccarat does. To me, the latter gleams in the light. It also has a noticeable heft, thickness, and weight that instantly stands out. Perhaps I’ve simply not seen a really special bottle from the other two manufacturers, but my point is that the Baccarat bottles seem to visually stand out, even in small photos on eBay, simply by virtue of the instantly recognisable look of the crystal. A 4.2 oz Baccarat bottle of vintage Shalimar that I recently bought. Photo & bottle: my own. Personally, I find all the rest of the CR or Pochet stuff to be confusing and deeply unhelpful. I’ve never seen any “bat” bottle that bears the mark of either company manufacturing. By the time most of these bottles come onto the eBay market, they’re so old that most of the signature on the base of the bottle has faded away. Even if they hadn’t, I have no idea how such information would help me to date a bottle. I’ve simply included the Pochet and CR information because it’s relevant to the history of Shalimar’s most famous bottle design and it may possibly prove to be useful to someone, somewhere, at some point in time but, for the average person, I would suggest sticking to the gleaming look of the Baccarat crystal if you want visual assistance in narrowing down your search to the really old bottles and sticking to the 1950s to mid-1970s decades. There is a blog called Guerlain Perfumes, unaffiliated with the company, which has the most exhaustive list of every bottle ever put out by Guerlain for any fragrance or body product since the company’s birth. It’s absolutely encyclopedic in its knowledge and focus, but I confess that I initially found it to be more confusing than parts of the Internal Revenue Code (and I find the U.S. tax code to be quite indecipherable). One reason why is that the blog’s analysis is organized by bottle design or shape, not by fragrance. So one has to go through everything to figure out if the bottle was made for something like vegetale body oil, Shalimar, or an entirely different product. Be that as it may, there is no resource like it if you want to know the design, history, size, weight, centimeter or inch height, manufacturer, and general, overall dates of production for a bottle. Shalimar War bottle, 1938-1945. Source: Guerlain Perfumes blogspot. The site shows that vintage Shalimar parfum came in quite a few other shapes besides the “bat.” Some I’ve never seen before. For example, from 1938 to 1945, Pochet et du Courval made a bottle called the “Wartime Edition” to house all the extraits, including Shalimar. During the 1940s, Shalimar parfum also occasionally came in the squat Jicky quadrilobe bottle. 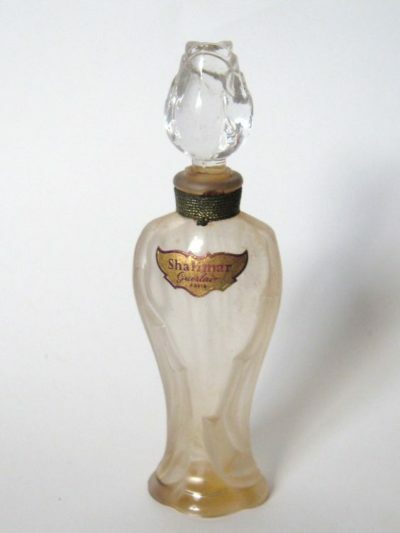 Vintage Shalimar parfum in the “Rosebud” bottle with the glass stopper. Compare the look of that stopper with the other bottle that, I’m guessing, is not as old and not from the 1950s. Source: Pinterest. Regardless of manufacturer, from what I’ve seen on eBay, the bottles are all 15 ml or 1/2 oz in size, and they measure roughly 4 and 1/2 inches high. They’re not widely found on eBay, and the prices are not cheap as a result. The price range seems to be roughly $150-$250. On a “price per ml” basis, that’s much higher than the amounts that I’ve seen the “bat” bottles go for. A third design called the “umbrella” or “parapluie” bottle was added to the Shalimar stable in 1952 and lasted until the late 1970s. This design was used for other Guerlain parfums as well, like L’Heure Bleue or Mitsouko. The Perfume Shrine writes that “the simple ribbed elongated bottle… was introduced in 1952 by Pochet et du Courval and was popular well into the 60s, with paradigms circulating into the 70s and even the 80s.” [Emphasis to words added by me.] In all cases, though, the parapluie/umbrella bottles are only 7.5 ml or a 1/4 ounce in size, and I believe they measure roughly 3 inches in height. Vintage Shalimar “Parapluie” or “Umbrella” bottles and packaging. Sources from left to right: 1) Etsy seller, Odona; 2) Pinterest; and 3) eBay seller, sam_in_barbate. The collage just up above is one that I made from photos that I found on the internet, and the potential dates of the bottles seems to be, going from left to right: the 1960s, 1960s, and either very late 1970s or early 1980s. The people who took the original photos gave estimates for the dates of their bottles and stated the reasons why. I don’t think they were pulling the information out of thin air because two of them seemed to have spent quite a bit of time researching packaging, bottle design, and bar codes. The third one, the seller with the leather case, repeated what I already knew myself. In short, I think their date estimates may possibly help you if you’ve got a bottle with a similar sort of packaging. The third packaging option was a brown and cream, wood-like, patterned or designed box that had images of people, animals, and the harvest on its top and sides. The lid opened on hinges to show a cream interior. Some boxes were lined in silk. As a rule, this type of box was typically a Marly Horse edition for the fragrance. (Much more on the Marly Horse later.) It wasn’t limited just to Shalimar parfum, but was also used for the extraits for other fragrances that Guerlain put out at the time. I have the sense that this box format originally dates to the 1950s, perhaps the 1940s, but it seems to have been used all the way through to the end of the 1970s. The average price range for the 7.5 ml bottles is usually about $45 to $85, but I’ve seen some eBay sellers asking for $120-$150. The photo collage below summarize things by showing the main or the historically significant bottle designs for vintage Shalimar parfum during the 20th century. It starts, from left to right, with the 1938-1945 “Flacon de Guerre” war bottle, then the mid-1940s Quadrilobe, the 1952-1970s Parapluie or Umbrella, the 1955-1970s Rosebud or Amphora, and the most common of all, the traditional, signature “bat” or “urn” bottle which has been in use from 1925 until the present day. (You can click on the photo to open it in a large size in a separate window. Vintage Shalimar Parfum over the decades. Original source of photos, from left to right: Guerlain Perfumes blog spot, Etsy, Angelaira’s Vintage Perfumes blog, me. Collage: my own. 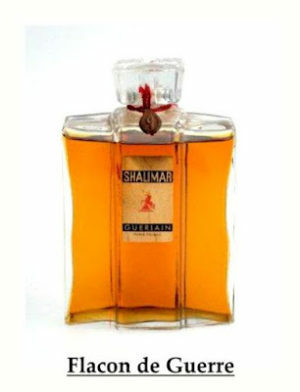 Vintage Shalimar eau de colognes comes in an instantly recognisable design. Officially, its name is the “Montre” or “Watch” bottle, but a some people call it “the disk bottle” because it has a round, disk-like shape topped by a pointy, conical, glass stopper. I’ve read that some of the bottles were made in Mexico, but people say that their scent is no different from the ones made elsewhere. As I said in Part I, I’ve never tried the cologne because I have no interest in the weakness of that concentration. Plus, I dislike the extra citrusy, brisk, clean, and light freshness that is typical of the cologne style, and I’ve read that the Shalimar one is very “refreshing” indeed. Be that as it may, it seems to be quite popular from what I’ve read. 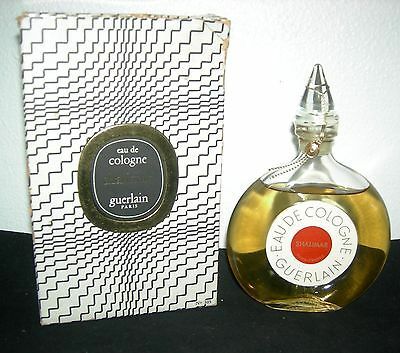 Plus, the cologne may be the most inexpensive and widely available of all the vintage Shalimar versions or formats. Vintage Shalimar Eau de Toilette, 8 oz 1976 bottle on the right. Small 1998 on the left. Photo: my own. The eau de toilettes for more than 30 Guerlain fragrances came in the “Goutte” or “tear drop” bottle, which is the same one you’ve seen in the photos of my large 1976 splash EDT bottle. The Guerlain Perfumes article says that the teardrop bottle was in production from 1923 to 2001. In addition to the Goutte splash bottle, the eau de toilette also came in an atomiser bottle of various shapes, like, for example, the one shown in the photo to the left. It dates to the 1990s. In the 1980s and later, the eau de toilettes were widely found in a narrow, rectangular-looking bottle design or in various types of atomiser canisters, like a gold lattice-looking one. One of the rarest types of Shalimar in the “bat” or “urn” bottle design was something called the “avion” or “Presentation Avion” bottle which was launched for a short time in 1960 on Air France flights from Paris to New York. The box was slightly different in the fact that instead of laying down inside the box, the bottle would stand up snugly inside a small plinth, in which the box lid would slip over making a cover. The stopper was not inside the bottle itself but was inside a tiny cardboard box which was included in the presentation box. The perfume was sealed with a cork covered in a thin plastic seal. These bottles were made by both Baccarat & Pochet et du Courval, look for their logos on the base, an entwined HP or the Baccarat symbol. I haven’t found any information on exactly how long the “Avion” bottle was available, but all the references that I have read mention only 1960, solo, and by itself. That leads me to think that the “Avion” bottle might have been a one-off thing and didn’t extend beyond 1960. If it did so, it was not for much longer. Marly Horse logo.This shape and look dates to my 1950s/1960s box. Photo: my own. When I began doing my research to find out why my mother’s 1950s bottle was so stupendous and earth-shattering in its richness (see Part I), the first thing I learnt is that vintage Shalimar parfum is not some uniform beast and that age really makes a difference. It wasn’t simply the obvious, well-known issue of scent evaporation resulting in a darker, more resinous scent over time. There was also some mythical thing people talked about called The Marly Horse. It was actually a presentation box, not a type of bottle or bottle design, but the word seems to have developed into some sort of short-hand code for an ultra special, ultra magnificent version of Shalimar parfum. The horse represented the famous Marly horse statues in Paris that now stand at the entrance to the Champs Élysées, and it was stamped on the inside lid of the purple, flocked velvet box in which the vintage parfum bottle was housed. (Based on what I’ve seen on eBay and elsewhere, the Marly Horse urn or bat bottles during the 1950s and 1960s always looked like Baccarat ones to my eye.) As you can see from my photo, the color of the velvet itself has faded into a pinkish mauve due to age. My mother’s 1950s Marly is practically a dusky rose in hue. In contrast, the velvet on newer, more recent boxes is a really bright, bold, imperial purple. The look, size, and location of the logo seemed to vary. From what I’ve noticed, the horse was smaller, less ornate, and located higher up towards the top of the lid in the 1950s, 1960s/1950s, and 1960s Marly presentation boxes that my mother and I own. It’s bigger on the boxes I’ve seen that seem to date from the 1970s with their bright purple colour. In addition, the design suddenly looks more elaborate, and the location of the horse stamp has dropped closer towards the middle of the lid. 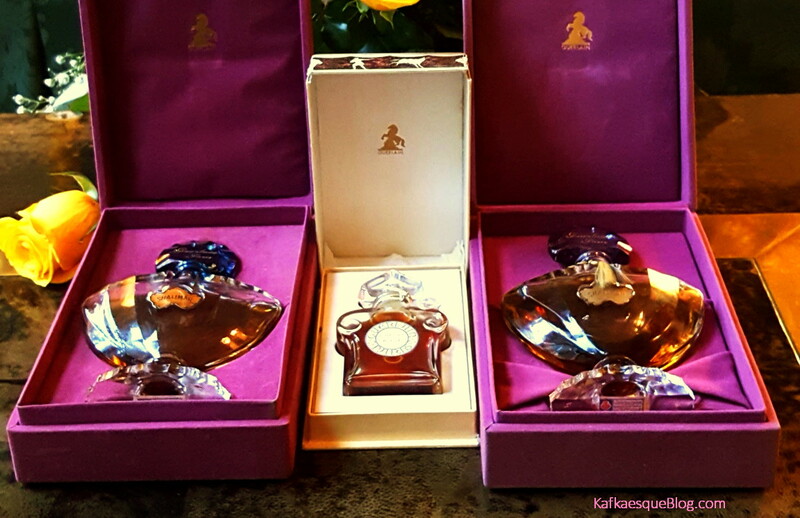 Marly Horse presentation boxes for vintage L’Heure Bleue and Shalimar parfums. The Shalimar bat bottles are Baccarat and you can see how they gleam in the light. Photo & bottles: my own. 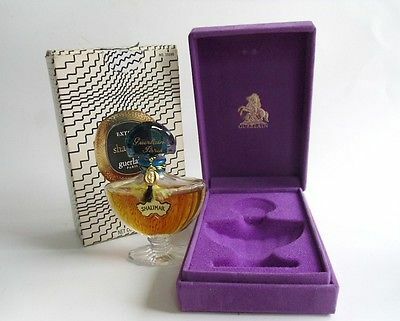 From my research, it appears that the Marly Horse logo was stamped on the inside lid of all Guerlain parfum presentation boxes issued during a certain time frame and for all the parfums concentrations across all bottle designs, not just for Shalimar or its urn/bat bottle. For example, you can find it inside the boxes for vintage Mitsouko parfum in its heart-shaped stopper design, L’Heure Bleue parfum, the Shalimar rosebud bottles, the amphora ones, and other designs so long as the fragrance was a pure parfum and was issued during a particular time frame. The question is, what exactly is that time frame?! I have no definitive or clear answer. The Perfume Shrine states that the Marly Horse editions “start[ed] from the 1930s and continu[ed] into the 1950s,” but I am firmly convinced that they lasted until much later. Look at the two boxes up above and how they differ from 1960s Marly/Baccarat ones that I own. In fact, I’ve seen eBay listings for Marly Horse Shalimar bottles that explicitly state that the bottle is from the 1970s. The fact that quite a few of the purple boxes (in any size) on eBay come with the “zebra” black and white outer casing is particularly telling to me as evidence against a 1930s-1950s time frame. The purple presentation box is only one of two layers of packaging; the outer zebra” or zig-zag, black and white boxes were not produced until 1967, and were in use through the early part of the 1980s. purple boxes + Marly Horse logo = a good step in the right direction. But it’s only the beginning. Another thing to look at is the colour of the velvet boxes themselves. If they’ve faded to take on a dusty, mauve-ish hue, then that’s a good sign of age as well. You should also consider whether or not it’s accompanied by the “Zebra” /zig-zag outer case. If it was, then fragrance dates to the latter’s 1967-1983 time frame, not before. However — and this is important — in my opinion, none of these things by themselves should be the dispositive factor that determines whether or not you buy a fragrance. They should not drive your analysis or decisions because, by themselves, they’re not as important as something else. Neither Marly horse logos nor oldish-looking, pinkish mauve boxes should drive your search because the thing that matters above all else, in my opinion, is juice colour. If you focus too much on the look of the presentation box or whether it has a horse on it, you may miss out on a truly fantastic bottle of fragrance. For vintage parfum, of any kind, the darker the liquid, the greater the likelihood of age. And, I firmly believe that older is better because it makes the olfactory bouquet richer, deeper, more rounded and with greater complexity and nuances. Focusing too much on the look and colour of the presentation box almost led me to miss out on a bottle of vintage Shalimar parfum that actually turned out to be the very best one that I’ve ever bought. In fact, I find it to be almost as beautiful and astounding as my mother’s 1950s Marly bottle. I cannot even begin to tell you how incredible it smells, how jaw-droppingly complex and opulent, how animalically furry in its opening hours but complex throughout, and how dizzingly powerful it is. When I received the package, the scent of bergamot, roses, and vanilla wafted with such force and reach through the sealed layers that my heart sank with the thought that the bottle must have leaked inside during transit. I was stunned to find that it had not; the purple box and bottle were intact inside, and buried within layers of protective packaging. This fragrance was just that powerful and rich. Still, what put me off a little when first seeing the eBay listing was the box. Many of the presentation boxes with that simple, one-word “Guerlain” stamp inside the lid seemed to be from the 1970s. (Not only were the perfumes inside often described as such by the seller, but they often came with the outer “Zebra” packaging that dates to the post-1967 era as well.) Now, there is absolutely nothing wrong with a 1970s bottle — nothing at all! — but I was specifically looking for something to try to replicate the scent of my mother’s 1950s Marly one. That has been my main goal for the last few months, and so I was hoping for something as old as possible. 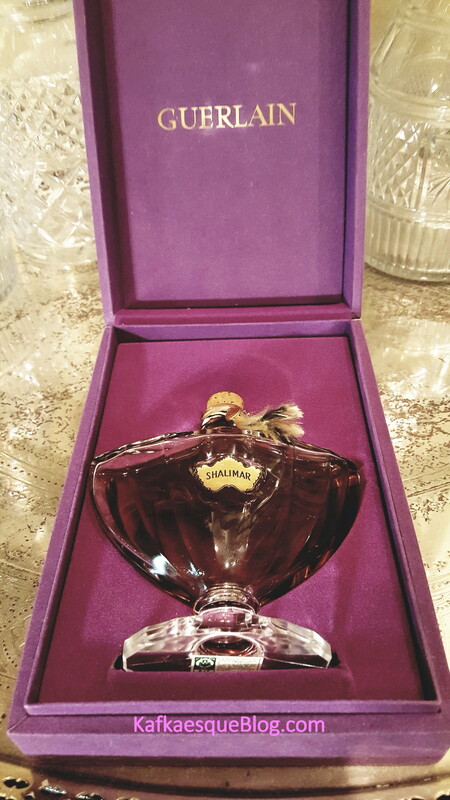 Vintage Shalimar, 4.2 oz Baccarat bottle, perhaps 1960s or 1970s. Photo: my own. There were three reasons why I put aside the whole 1970s possibility and bought the bottle anyway. First and foremost, the colour of the juice. Even in the seller’s poor quality eBay photos, it looked extremely dark. In person, it is such a dark mahogany, walnut brown that it looks almost black from a distance. I think the colour may actually be even darker than my mother’s 1950s bottle! It’s not dense and not syrupy as molasses like my mother’s (the juice in mine is very liquidy in concentration), but the colour… my word! Vintage Shalimar, 4/2 oz Baccarat bottle, perhaps 1960s or 1970s. Photo & bottle: my own. I ended up winning the auction for $102.50 in total (with priority shipping included). It’s an amount far below what it’s worth and also far below what I’d put in as a maximum bid. I’d lost a previous 4.2 oz bottle when I’d been unwilling to go above $225, and I’d been willing to go that high for this one because the juice in this was loads darker. I think $102 is simply astonishing for any vintage Shalimar parfum in such a huge size, and I’m not saying that solely because I’m completely gleeful about my incredible luck and good fortune (which I am and which I’ll probably continue to be for months to come because I honestly can’t get over the price!). I’m harping on it because its proof that knowledge about Shalimar bottles, patience, and keeping an open mind can pay off. Early in my quest, I’d been considering a few listings for 1/3 or 10 ml bottles, a few of which weren’t even completely full, because their $85 or $95 price seemed affordable and fit my budget. As my research taught me more and more about bottles and technical details, I realised that they actually weren’t a good deal at all on a price per ml basis. In fact, the best bargains came from sellers who didn’t really know a lot about their bottles, who weren’t frequent vintage sellers, or who had rather shoddy looking photos. The key is, you first have to arm yourself with knowledge about what to look for — which is what I’m hoping this guide will do for you — but don’t let any one factor limit your options, perhaps not even the issue of juice colour. All of this, every single thing that I’ve written thus far, is useful under a certain set of circumstances, like whether the bottle has extra dark juice or the eBay seller has photos of the box. But what if the liquid colour is just like that in every other bottle out there? Or what if there are no box photos, no packaging information, and zero information on the age of the bottle? How do you decide then, especially if you’re trying to choose between two similar listings at roughly the same price? At that point, one has to look at the actual bottle itself for clues as to its age. The design itself doesn’t help much since so many vintage Shalimar designs were used until the 1970s, in some instances until the early 1980s, and, in some case of the “bat” bottle, well into the present day. The simplest and easiest starting point when it comes to vintage Shalimar is to look at the actual label on the bottle itself. Does it have one word on it, or more? The label on all the “Bat” parfum bottles is called “the dolphin;” as a general rule, from 1925 to the mid-1980s (and ignoring a weird exception from 1925-1936 for the “No. 90” bottle), the wording from 1925 to the mid-1980s had only one word on it: “SHALIMAR“. Vintage Shalimar labels. Photo: my own. A one-word “Shalimar” name could still be an early 1980s Saint Gobain bottle, so if you’re looking for something older, then you have to turn to other clues yielded by the bottle. For example, acid-etching versus cut words on the bottom of bottle; the thinness or chunkiness of the fluted stem; and more. The bottle on the left dates from 1981-1986, and has a chunky, squat, fat stem. That stem is a tell-tale giveaway of a newer bottle by Saint Gobain, and is a dating factor that I’ve relied on a lot. 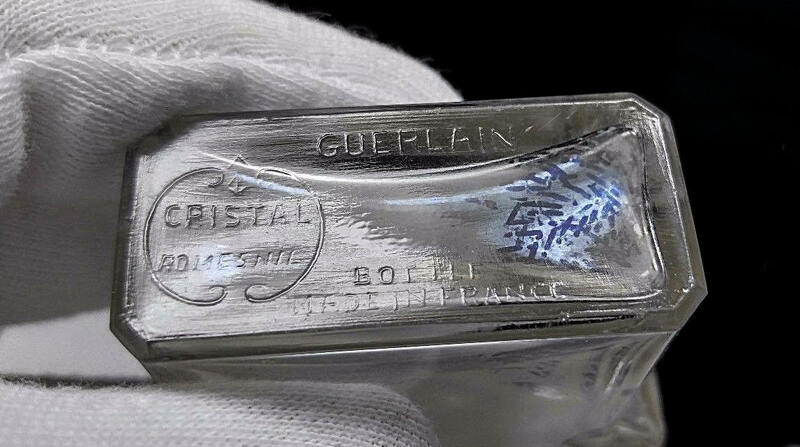 According to the Guerlain Perfumes blog, Saint Gobain bottles also had “wide feet” and, if you look at the base of the bottle here, you can see they’re talking about. The bottle on the right is older. It’s from 1970s and is probably a Pochet bottle. It has a thin, inverted bottle stem, and a narrower base (or “feet”). There are also differences in the font and size of the words “Shalimar,” in the size of the label, and in the thickness of the black trim around it. 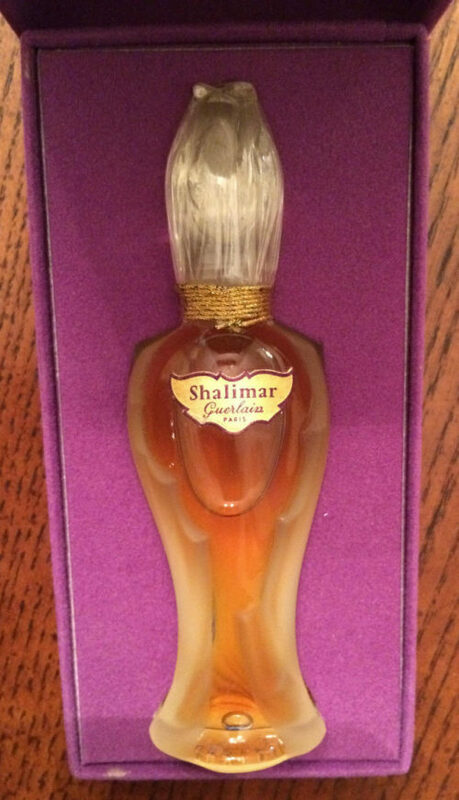 Vintage Shalimar extrait, 1 oz bottle by Saint Gobain, circa 1981-1986. Photos: eBay seller, “luxe_artifacts.” Collage by me. The Pochet “HP” squiggly symbol to the far right. Photo: my own. The stamp on all the “bat” bottles that I own or have seen on eBay look nothing like that. The letters are often very difficult to make out unless you look extremely close and in the light. Even then, some of the letters have faded out of sight completely. And there is absolutely no manufacturer’s mark at all. The only things that are clear are perhaps the only two things that matters: 1) the letters are not carved deep into the glass of the base; and 2) they are accompanied by the old paper stamp whose use goes back to the 1950s, the 1960s, and even earlier. 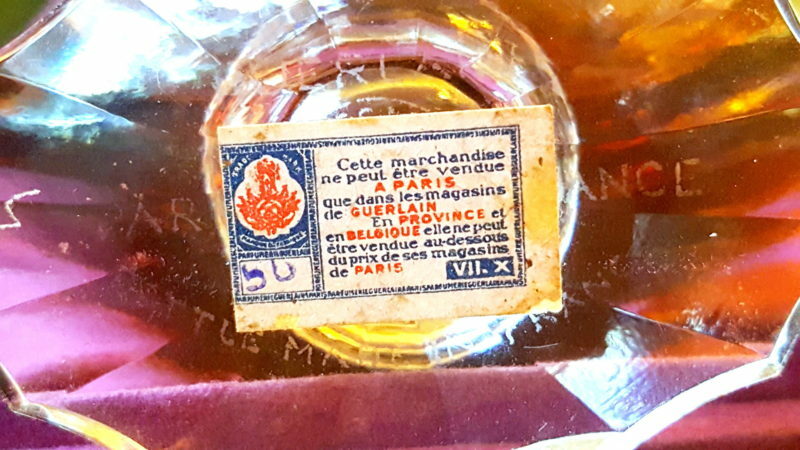 Guerlain and “Made in France” stamps on base of my 4.2 oz large vintage Shalimar Baccarat bottle whose date may be from the 1960s. Photo: my own. Do you see how the shape of the letters, like “Guerlain” or remainder of the “France” word, is somewhat shadowed in shape? Well, the font is much finer on my two Marly bottles that date to the 1960s/1950s and the 1960s. Those two also bear a paper stamp, but lettering is so fine that they seem to be etched in acid. In addition, both have weird symbol curlicues to one side, one of which clearly looks like a “2” or “Z,” but I don’t know what that means, if it’s the remnant of some Baccarat stamp, or something else. 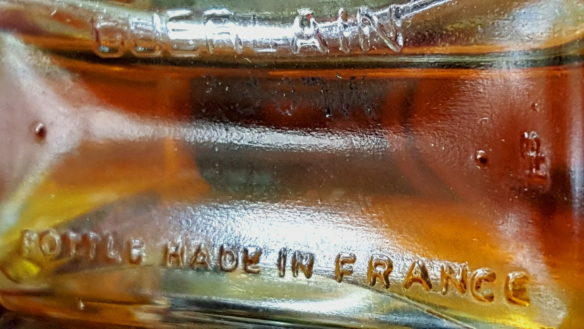 Still, observe the nature of the letters (to the extent that you can see them with all the fading) because this is an example of the “acid-etching” that I and so many others talk about with regard to the older bottles, particularly those done by Baccarat. Sticker from the 1930s to late 1940s. The text is in two colours, red and blue, the word “Belgique” is included, and the Roman numeral is located on the lower right. Photo: my own. Early 1950s sticker because it’s in red and blue, it does not have the word “Belgique,” and the Roman numeral is located on the left. Photo: my own. 1967-1976 base sticker for L’Heure Bleue extrait. Photo: my own. Letters carved into base of a 1976 vintage Shalimar EDT bottle. Photo: my own. Photos by Basenotes member, Ayelfior. Source: Angelaira’s Vintage Perfumes blog. Please notice how the actual size and shape of the glass base differs between the two in addition to the nature of the “stamp.” The Saint Gobain bottle on the left shows the use of some sort of engraving method to carve the words deep into the glass itself. It has a clear plastic sticker as well, although I personally think that those stickers were circa 1984, given other Shalimar bottles that I’ve seen in lower concentrations from 1984 onwards, so I don’t think they were typical to the earliest 1980s Saint Gobain bottles. Saint Gobain, chunky squats stems, and fat feet = not so good. What happens if you find a bottle with a narrow stem and solo “Shalimar” label, but you can’t tell anything else about it? You can’t see anything on its base, and you can’t even figure out something as basic as its size, whether you’re looking at it in person or via an eBay photo. What then? Some eBay sellers give no specifics about their bottle except for its height from the bottom of the base to the top of the blue glass stopper. That’s it. They give absolutely no other information. They don’t even have an idea as to how big the bottle is in ml or oz. That is obviously a factor which will impact how much you want to spend, or even if you want to buy the bottle to begin with. I recently found myself in the position of trying to figure out just how big the bottle was based on nothing more than its height in inches. The price was fair and the photo of the presentation box showed an indentation that — proportionally speaking and relative to the rest of the box — would seem to suggest that the bottle was a large one. Yet, the one and only bit of information that the seller provided was its measurement, and even that was just a rough estimate, somewhere around 4″ (inches) from stopper to base. It turns out that the bottle was, in fact, a tiny one in terms of its ml or oz weight and, therefore, not worth the asking price (to me), but I would never have been able to ascertain any of that without the invaluable and encyclopedic breadth of details in the Guerlain Perfumes blog article. It really is a brilliant piece of work. If you go to the “Flacon Chauve Souris” section midway down the page, you’ll see a list of height and oz/ml figures. It’s divided into 2 sections, one just for Baccarat, and one for all the other manufacturers. The latter sub-section sometimes includes dates for the bottles, based on Guerlain’s official quantity numbers on a bottle (“10cc/10ml/0.388 oz,” to give just one example), as well as dates for when Guerlain dropped the “cc” part to only use “ml” and/or “oz” instead. In two instances, those changes correspond to when Saint Gobain was in charge of the bottles during the 1980s. It’s an innocuous looking list with a seemingly mundane set of minutiae and I initially thought it was quite irrelevant, scrolling quickly past it each time I saw it during the last two months, but something suddenly clicked in my head this weekend: what if I could use the height measurements to not only figure out the amount of juice in each bottle, but also, in a few cases, the general age of the bottle? It would be a ballpark estimate and far from certain or specific, but even knowing that a bottle was a 1940s to 1970s one could be useful. In two instances, if you knew the exact height of your bottle, you could figure out that it was made by Saint Gobain sometime from 1981 to 1984 or 1981 to 1986! I wish there were a similar height-ounce-date connection for the Baccarat ones or for all the Shalimar parfums as a whole but, alas, there is not. None of the Baccarat information on her list comes with a date. 3.5″ (inches) or 8 cm 10 ml or 1/3 of an oz 1954 or after. 3.23″, 8.2 cm, and has wide feet 10 ml or 1/3 oz 1981 to 1984, by Saint Gobain. 3.66″, 9.3 cm, and has wide feet 15 ml or 1/2 oz 1981 to 1986, by Saint Gobain. 1964 onwards, changed in 1978 to register as 15 ml, so dates are 1964-1978 and quite possibly beyond. 3.94″ or 10 cm 30 ml or 1 oz anywhere from 1948 to 1978, and quite possibly beyond. 5.91″ or 15 cm 60 ml or 2 oz anywhere from 1962 to 1978, and quite possibly beyond. Those are not all the bottle sizes, measurements, or weights, so you should check the actual post. As a side note, the dates listed may not be set in stone. Also, the caveat — “and quite possibly beyond” — is one that I’ve added myself because the 1978 dates given by the blog seems to refer, I think, merely to when Guerlain changed its official measurement from cc/ml/oz to just ml/oz. One cannot infer from that that Guerlain actually stopped making the bottle entirely after 1978. It’s not a logical inference from a simple, passing change to the measurements listed on a label or box. Plus, we know that, from 1978 to roughly 1981, Pochet manufactured bottles in different heights and sizes until Saint Gobain took over. Be that as it may, at least the height measurements can give you a general idea of when your bottle was produced. So, if any eBay seller says that their bottle is 5.91 inches, you know that it might be as old as 1962 or, at the very least, somewhere in the vicinity of 1962-1978+. If it doesn’t have “fat feet” or a chunky, stubby stem, you can be more confident that it’s 1962 to roughly 1978 (or 1981), and, hey, that’s a pretty good about of dating specificity to have from just some inches, right? If, as I’ve observed at least 9 times in the last few weeks, an eBay seller says that the bottle is “roughly 4 inches high” or “roughly 5 inches high,” then you can ask them to measure it precisely, then plug-in the Guerlain Perfumes blog numbers to get a rough time frame for your bottle. No decent seller could or should possibly refuse such a simple, reasonable, and easy request that involves nothing more than them getting out a ruler to measure their item from top to bottom. If your eyes have glazed over at the technical nature of all this, I’m truly sorry and I also emphasize deeply. It’s a lot of information, and I remember how overwhelmed I was at first when starting to learn all the technical details. So, if you’ve lasted this long and also read everything, Bravo! Even if you’ve skimmed, I’m grateful for your patience. We’re getting to the end. I swear. look for an alphanumeric batch code on the bottle base or the box, then check the Raiders of the Lost Scent’s 2013 Guide to see what year it corresponds to. If there is a sticker on the bottle, look at their Sticker guide instead. Avoid all stubby, squat, chunky bottle stems if I wanted to avoid 1980s era bottles. brown-and-white presentation boxes for these other bottle styles — the ones that showed animals, men, and the reaping of the harvest — were just as old as the bat bottle’s purple velvet boxes, and, in some cases, had the “Marly horse” logo as well. The Guerlain Perfumes Blog‘s long and very detailed 2013 article on all Guerlain bottle designs for all concentrations, including all the design styles mentioned here. If you’re researching vintage Shalimar parfum solely in its signature bat or urn bottle, the Guerlain Perfumes Blog has copied all the relevant information from the original post into one narrowly focused just on the bat or “Chauve Souris” bottle, and that may be easier for you to navigate because it’s not as long. 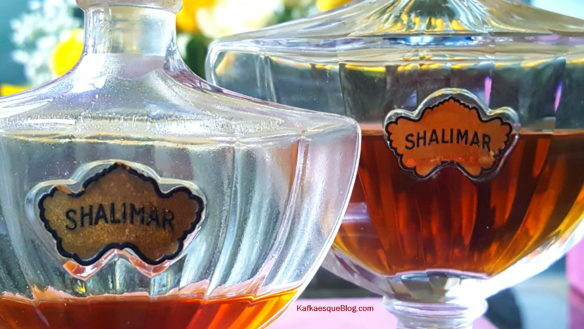 Angelaira’s Vintage Perfumes has a very helpful 2012 article that preceded all the others and that lets you visually compare the stems, base markings, label, and overall look of vintage Shalimar in its bat shape. 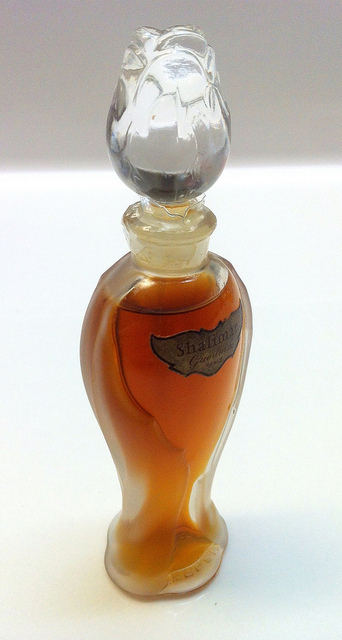 There are one or two photos of bottles of other Shalimar concentrations as well. Raiders of The Lost Scent‘s 2013 Guide applies to all Guerlain fragrances, but focuses almost entirely on the batch codes on their boxes and bottles. It’s most useful for fragrances that come with a box, were produced in the years after 1967, or have codes prior to 1976. It didn’t really help me with fragrances from before 1976 (which is when the batch codes really kicked in), or with the differences between various bottles of Shalimar in terms of its design or look across the years. To be clear, I’m not criticizing them for that at all because that was never the guide’s goal or purpose. There is no better or more precise, helpful resource for the specific dating of bottles post 1976 than this one! A few brief words on some dates that you may encounter often on eBay. First, if you see “No. 7090” on a box, that is not the batch code! 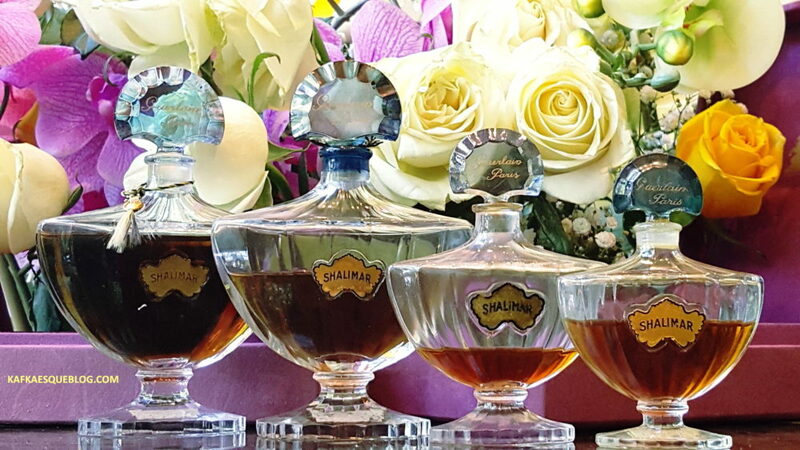 It’s Guerlain’s internal product code for all Shalimar fragrances, across the decades. Think of it like a supermarket’s produce number for bananas versus oranges. Second, if a listing proclaims “1967” as the date of the bottle, don’t believe it. 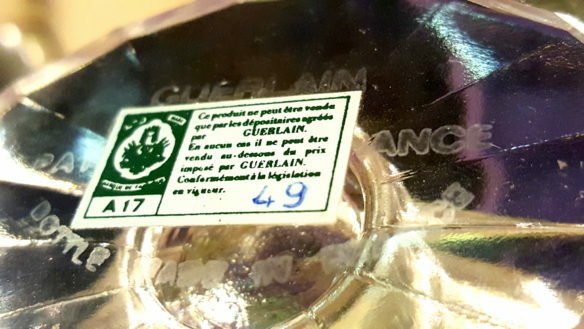 The seller is confusing Guerlain’s legal copyright date on its Zebra boxes with the date when the actual perfume was produced. Guerlain 1967 copyright. That does not mean the bottle dates to 1967! The perfume in this box is mine and has batch codes for 1976. Photo: my own. For those of you unfamiliar with the legal terms, that just means 1967 was the year in which Guerlain filed papers with the government to protect the look, style, and design of its bottles and boxes. Depending on the country and its laws, copyright can last for 20 years or longer. Guerlain filed another claim in the early to mid 1980s when it changed its Zebra box to its black/gold one. So, if you see a listing for a “1967” bottle, ask for the other numbers on the box or the bottom of the bottle. It should be a mix of letters and numbers, and it will give you the actual date of the perfume. Changing topics, as my research taught me more and more about bottles and technical details, I began to realise that I needed to keep an open mind about what I saw on eBay and not limit my options. Many of the glitziest, cleanest, best lit, or most eye-catching eBay listings actually turned out not to be such a great deal for the price when the size, age, box, or some other factor was taken into consideration. In fact, the best deals came from sellers who didn’t really know much about their bottles, who weren’t frequent vintage sellers, or who had rather shoddy looking photos. They were typically the ones who had stumbled across a bottle by accident, who never sold perfume, or who had been left the bottle by a relative. They didn’t know what they had and, often, didn’t seem to care much about it. They simply wanted to get rid of it without going to the trouble of a lot of fancy photos or details. Some of them actually listed their bottles in the wrong section (like, regular Shalimar, not “Vintage” or “parfum”). And they rarely had much information about the bottle beyond, perhaps, its measurement in inches. All my best Shalimar bargains have come from these sorts of sellers, but it’s because I armed myself first with knowledge about what to look for — which is what I’m hoping this guide will do for you. Keep an open mind about everything that you see on eBay — from bottle photos to what the boxes may look like or the sellers who don’t seem to know what they’re talking about. Don’t focus primarily on sellers who have the best photos or multiple Shalimar listings. These listings may look good on the surface but, if you arm yourself with knowledge, you can get much better deals elsewhere and some of them may end up to be astonishing bargains! Don’t limit your searches simply to “vintage” Shalimar, either. If a seller doesn’t know what he has, he may well list it as regular, basic “Shalimar” with all the other modern ones. I found one great bottle where the word “vintage” was not mentioned anywhere in either its title listing or in the text description. I passed on a second vintage bottle that was listed with the regular, modern ones because it was too small and it was a similar sort of situation except, this time, the seller said in the description that she’d gotten the bottle from her mother in the 1980s. She never used the word “vintage,” though, so if that is how you are conducting your searches, you could miss out on some options. It’s a lot like looking for a needle in a haystack at times, but sometimes the haystack shrinks to almost nothing because eBay seems to have availability cycles. I’ve seen it time and time again for vintage fragrances from all sorts of brands; there will be times when there are more than a 100 entries, then times when there are like 10. 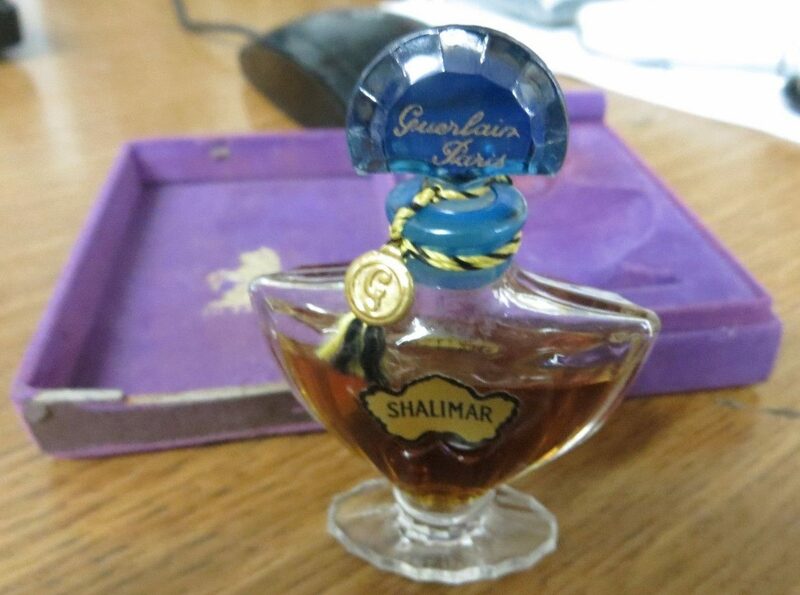 Two months ago, when I first started looking for really old Shalimar, there were about 125 listings each week for different concentrations of “vintage Shalimar perfume 1 oz.” That was a broad umbrella search which also brought up bottles listed as “1/4 oz,” “1/2 oz”, etc. Out of those, roughly 70-80 would be for the pure parfum, sometimes far more. In fact, there was one seller alone, “vivientreasures,” who had almost 10 different parfum bottles for sale. In contrast, when I plug in the same search today, the combined total is a mere 37, and a number of those listings are for completely empty bottles or for the Parfum de Toilette. So, be patient, it’s feast or famine on eBay, and you may need to wait a few weeks or months to find a bottle that fits your budget. 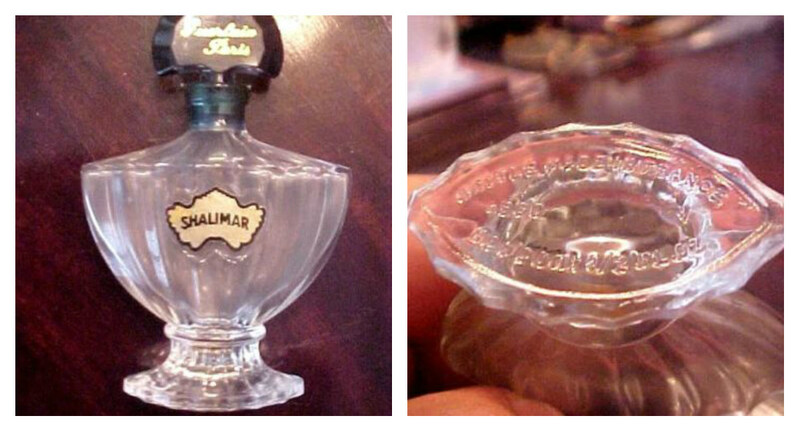 Shalimar vintage extrait (parapluie, rosebud, and bat bottles come up). So, that’s it! We all survived this monster post and the Shalimar marathon! Thank you for your patience. I know it’s a huge amount of information and that the technical aspect of the details was probably quite overwhelming at times. But information is both power and money saved, and once you get the hang of the basics, I think you’ll be whipping through eBay in no time. Nothing would make me happier than if this ridiculously long post helped you to find a great and really old bottle for a good price. Happy hunting! 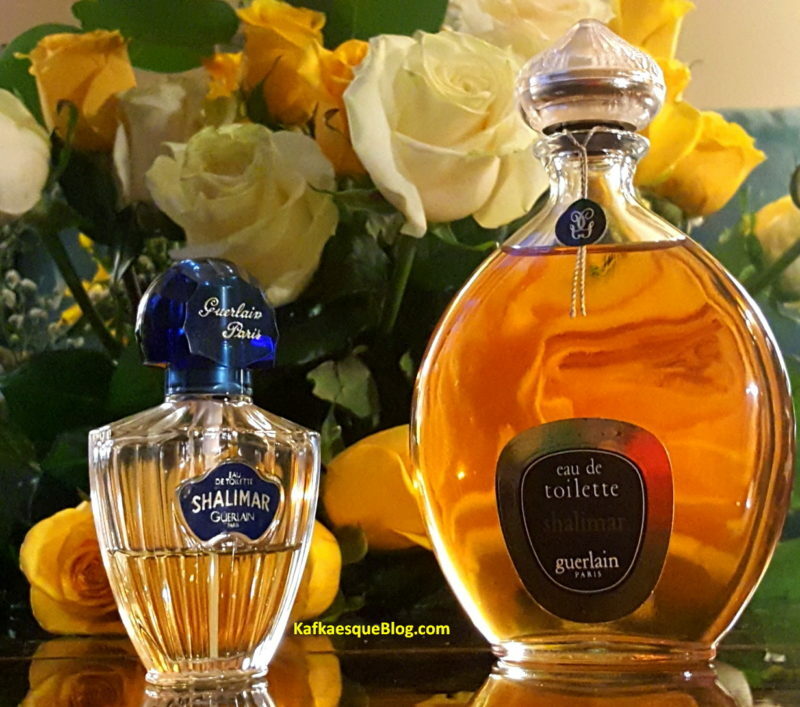 This entry was posted in Floral Oriental, Guerlain, Orientals, Perfume Profiles or Interviews, Vintage Fragrances and tagged Baccarat crystal Shalimar bottles, Cristal Romensil Shalimar, Cristal Romesnil Shalimar bottle, Dating Shalimar bottles. Dating vintage Shalimar on eBay, Guerlain batch codes, Guide to Vintage Shalimar, Guide to Vintage Shalimar by year or bottle, How to date Guerlain bottles, How to date vintage Shalimar, How to recognize vintage Shalimar, How to tell Shalimar apart, Marly Horse Guerlain bottles, Marly Horse purple boxes, Pochet et du Courval bottles, Pochet et du Courval Guerlain bottles, Saint Gobain des Jonqueres bottles, Saint Gobain des Jonqueres Guerlain bottles, Saint Gobain Shalimar bottles, Shalimar Baccarat crystal bottles, Shalimar rosebud bottles, Shalimar Umbrella bottle, Shalimar vintage Parapluie bottle, Vintage Guerlain box differences, Vintage Shalimar, Vintage Shalimar Amphora flacon, Vintage Shalimar during the war, Vintage Shalimar eau de parfum, Vintage Shalimar Eau de Toilette, Vintage Shalimar Parfum, Vintage Shalimar Parfum de Toilette, Wartime vintage Shalimar, What are the differences between Shalimar concentrations by Kafkaesque. Bookmark the permalink. what a plethora of knowledge, work and love you put into your 3-parts blog post on Shalimar ! I am in awe and thank you so much. 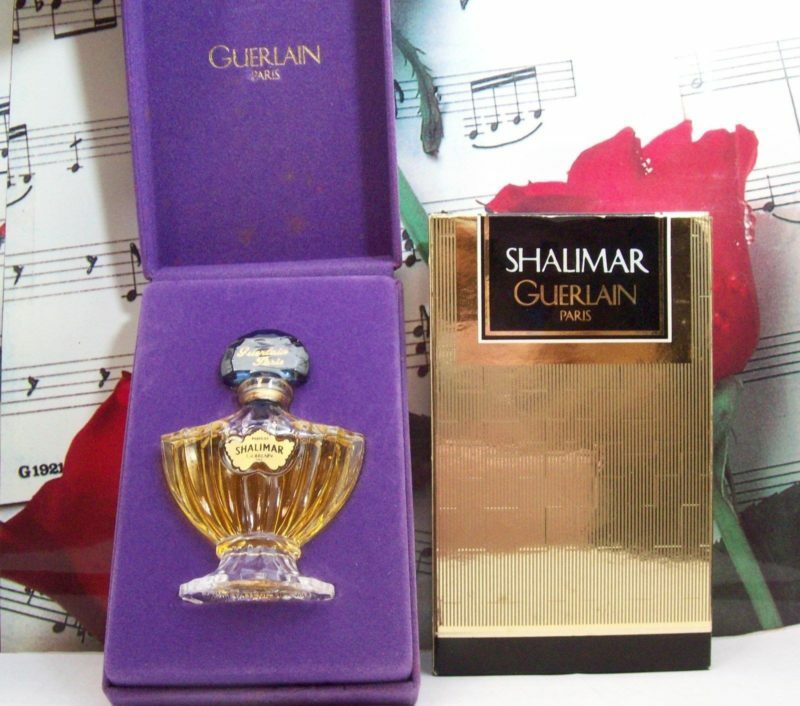 I am lover of Shalimar, or Guerlain in general, so it is of huge value for me. What I had heard about the “Avion” Bottles : They were made with a cork stopper plus an extra glass stopper, because the changes of air pressure in the plain would cause the glass stopper to crack or “glue” un-loosable into the neck of the bottle. The cork provided a somewhat elastic effect, hence nothing was destroyed. I have no idea if this was true, but I got this explanation from a lady who worked with Guerlain in Germany in the 1950’s already. Wonderful details and additional information on the Avion bottles, Martina! The cork story makes perfect, logical sense, and I’m sure it’s true. Thank you for sharing it. I sent you a mail with the photos of the Shalimar “Nibs” – no idea how to include them here in my answer. Sorry. Thank you so much for this exhaustive and invaluable piece of research. I can’t even begin to imagine how much time and effort you put into it. I confess to being a “Shalimar virgin” but I now feel armed and ready to embark on a long search for the right bottle. I can’t imagine striking as lucky as you did, but I promise to be patient! All your readers must be eternally grateful. But you know, it would be WORTH EVERY SINGLE MINUTE of all that work if this guide helps you and hopefully a few others as well, particularly if you’re Shalimar virgins or simply vintage virgins in general. It would thrill me beyond belief if a number of you found not only a good bottle at a good price but a new perfume *love. * I hope so much that your first encounter with vintage Shalimar sweeps you away. Will you let me know how you fare, either during your hunt or once you find a bottle? Of course! My first search has been a total disaster, with lots of Parfum Imitial and huge amounts of vintage advertisements. But I will persevere and make you proud!!! Enjoy your rest and try not to turn into a cockroach. Immensely useful article, it deserves only one word: BRAVO ! Wonderful information. 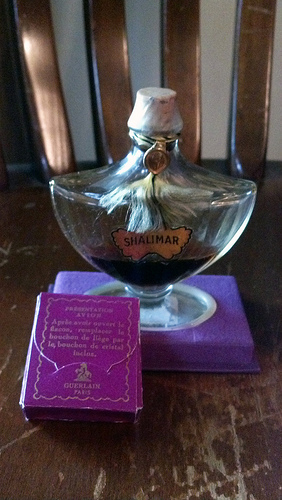 Shalimar parfum has been my most loved fragrance since I was a young girl, which predates zig-zag boxes. Sigh. Your description of the EDC version is intriguing and reassuring. I will definitely keep an eye out for a bottle as a result. Thank you, Lady May. Absolutely splendid! What time and effort you have invested in this so very interesting and educational three posts. When I started with perfumes around three years ago, I tried so hard to put one and one together. Here now, is an absolute wealth of information and, even more so, experience and admiration. Therefore: thank you so very much! On a slightly cautious note: If I am not mistaken—I certainly may be, I hope so—but “Raiders of the Lost Scent” seem to have deactivated the info on Guerlain? Dior, YSL etc are still there, only the treasure trove of Guerlains Batch Codes are gone. I might be wrong; perhaps there are updates coming along? This must have happened within the last 24 hours, as I looked up some things yesterday night (Continental time). Wow, it’s not there. Hopefully it will come back – it’s so helpful. I have the text part saved since the whole thing earlier this year with Monsieur Guerlain. Maybe an update.. The Guerlain batch dating pages are back! Sorry for the scare. You’re more than welcome, On Wings of Saffron. Thank you for the kind words on the guide, but also for alerting us to the situation with the Raiders page and its subsequent return. It would have been terrible to lose it, so it’s quite a relief that it’s back up. I appreciate all the hard work you put into these posts. I’ll be re-reading them from now until the end of time. I am now ready to begin my search! Happy hunting, my dear. May your fabled eBay luck continue to hold strong. As I write this I am holding my Marly Horse box in my left hand. Using your information I believe it is from the 1950’s or 1960’s. However, the acid etching on the base is readable from above (if that makes sense). The stamp is there, with 44 printed as part of the stamp, but I can see a very faint 20 in the white area. My bottle also has a white “napkin” around the stopper imprinted with Guerlain. Sounds wonderful, Reddtx. I’m so glad you could figure out the age of the bottle. I can’t wait for you to open it, because I’m sure its scent will be absolutely fantastic. Guy here. I read through a couple of times and I may have missed it, but was there a time period where they etched the base so you read it from above versus read from below? Could that be an indicator of age? Forgive me if I missed this. I don’t know. 🙂 I’m sorry, I wish I knew the answer to your questions. I’ve never read anything about the top/bottom thing anywhere. What an INCREDIBLE resource you just gave us, Kafka. I must say the sheer amount of information is kind of daunting (but ultimately, so incredibly useful!) but I cannot wait to find the time to bury myself in ebay listings. You definitely rekindled a fire for vintage-Shalimar in me. I’ll definitely tell you if I manage to grab a nice one. Thank you, my dear, and I agree that it’s an extremely daunting amount of information indeed. Stick to the summaries or synopses at the end of the post as an initial starting-off point because they would probably be easier. Then, later, if you want, you can delve into the detailed sections for any further information that may pop up as a factor in your searches. Happy hunting, Anne! Dearest Kafka, I’m a little bit emotional right now, because I just received a 1 oz, nearly full bottle of pre-1957 Shalimar. I thought it’d be 1960 (it came with the Avion Presentation little cardbox thing), but now I’m thinking the woman who used to own my bottle might have had another one and mixed up the packaging, because it has a pre-1957 stamp. I also got a Marly box in a satisfyingly dusty purple. The juice has darkened a little bit, but not nearly as much as your Avion bottle (judging from the pics). I paid a decent price, too (and the seller was fantastic, it arrived in mint-condition). I haven’t opened it yet (will do in the morning so I can enjoy it ALL DAY), but I can smell it a bit from afar and I am all giddy. I am having a Mitzah-like meltdown I think. I’m going to read your review again and will report back when I have gathered my thoughts. Thank you SO MUCH for all the information, I would never even have thought about looking on American ebay without you and your massive amount of knowledge, much less been able to actually find a worthy bottle. Ahhhh I have realized a years-long dream. After reading your reaction, I feel as emotional as you do, cherie. Anything compared to your Mitzah reaction is wonderful news. I have the feeling that how you reacted to your first sniff of the Shalimar is a little how I felt upon sniffing my mother’s bottle. There was such an indescribable euphoria, such giddiness, such an overwhelming feeling that it practically swept over my brain and body, impacting my nose. At least, I hope that is how it was for you, too. I can’t wait to hear more about your experience, what parts you loved the most, and how all of it compares to other fragrances that you may have tried in the past. If you’ve really and truly fallen in love, I should warn you that vintage Shalimar can turn into quite an obsession, a persistent madness that won’t give up its grip on you. 😀 😛 Months later, the obsession and passion hasn’t faded one bit. I’ve never quite experienced anything like it, not even with vintage Opium! If it strikes you in the same way, at least you’re presently in the US where eBay offers far more opportunities than what you might find in France. My suggestion to you is to go after a really old bottle of the EDT as well. It’s absolutely a delight beyond words! By the way: the little Présentation Avion cardbox (which one can see on the picture you posted from the Basenotes member) contained a crystal stopper -that’s what the writing on it says! It also has advice to switch the cork stopper for the crystal one when opening the bottle after the first use. So while a cork stopper is a very good indicator of a Présentation Avion bottle, it’s not a required thing either. Ultimately, though, the only real thing that makes an Avion bottle stand out is its rarity and, in my opinion, none of that matters as much as what the fragrance smells like. For me, at the end of the day, age and its impact on the scent will always be more important than packaging. So, it’s the stickers that are really telling, regardless of the presentation of the bottle, its stopper, or its outer trappings/box. You got a pre-1957 bottle, and that’s what really counts here. I have no doubt that it’s utterly glorious, a real feast for the senses. Congratulations!!! What a cool read this series has been! Not that I’m going to go hunting for Shalimar any time soon – she doesn’t do much for me. (In contrast, old Emeraude just knocks me out. Love the stuff.) I have never tried any Seriously Vintage Shalimar, though, and maybe that makes the difference… but probably not, given my usual tastes. I did think the early-80s Shalimar parfum de toilette was pretty good stuff, but I wasn’t wearing my bottle except in the fall when it was raining, and that’s a limiting sort of experience, so, off it went to a new home. In any case, I loved reading the results of your research. Seven thumbs up. It’s nice to see you, Mals, and I hope you had a nice summer. Thank you for the kind words on the research. I’m glad you enjoyed the posts. What an incredible and exhaustive body of work. I am impressed and grateful for this guide. I read every word and checked out the Guerlain blog. I was not a Shalimar lover, but your guide sent me on a quest to find the magical 60s extrait or an aged EDT. I purchased an unboxed 1/3 oz. I am dead sure is not a Gobain bat; it looks more like Pourchal and is just over 3 inches. The perfume has a long,, lemony raw bergamot topnote before going to vanilla and jasmine. No amimalic note detected. I estimated it at early 80s. None of this would be possible without your guide. Thank you! I don’t detest modern Shalimar, but it’s not to my taste either. I wondered what all the hype was about until I read your articles. It’s safe to say the finger of obsession has touched me:-) Must find that magical aged juice. Question: Are the bottles with the labels on the bottom all before a certain year? Are you referring to the labels that look like postage stamps? White with blue writing and often a number in a square within? If so, then I have the sense that they were used up to the mid or late 1960s, but it’s hard to know for certain. My cork-stopper bottle which has one turns out to actually be a 1960 Avion Presentation bottle, so I can’t use that to conclude the stamps were in usage in the 1970s. I don’t have the sense that they were, but who knows. Still, if you see an eBay bottle with one of those paper postage-like labels on the bottom, it’s a good bet that the bottle is 1960s or earlier. Unfortunately I can’t tell you more than that with any certainty or specificity. I wish I could. I’m looking at a 25% full teardrop cologne bottle with an orange red stamp on the base and French flag. The front label is missing — and it’s not silkscreened on the bottle. Sorry, Kafka, that teardrop bottle I have my eye on is EDT not cologne. And the stamp thingy is two colors, mostly blue, some orange. The stopper is lovely, grooved, frosted glass. It’s an auction an early days, unless someone buys it now. maybe here you could find some useful infos….. 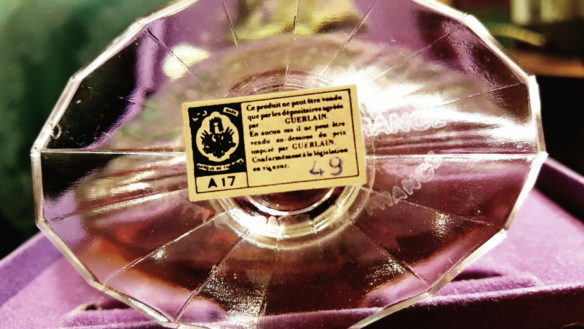 Since Guerlain “stickers” changed during decades., at least one of your Shalimar bottles could be apparently dated back to 1940 (or even earlier). What a Superb finding! Dear Andre, you and Elena are fantastic, a truly invaluable resource to the entire perfume community. I absolutely love your latest guide, and think it’s beyond helpful. My kudos to the both of you. I’ve updated both Part I and Part III of my Shalimar Guides to talk about it and to include a link, in addition to adding one extra photo of the base stamp/sticker on one of my bottles in Part III. It seems to be a 1950s to 1957/1957 stamp according to your guide since it lacks the word “Belgique,” has Roman/Latin numerals, and “magasins de Paris” in the text. I’ll be doing a vintage L’Heure Bleue article soon and I will be sure to link to both of your guides in it. So, let’s say we have the following situation; you’ve got listings for a bottle that you’re certain dates to the 50s or 60s, but you also have a listing for a bottle which you’re not sure dates to the 60s or 70s, but it has that darker color. Which one do you buy? I say buy ’em both…. you only live once! Ha, Option C! And a very good Option C, too (if one has the money to do it). Either way, I like your style, Guy. Interesting! I was thinking everything else held constant; they’d be the same price and the same size. When I was scouring Ebay for vintage Shalimar throughout this past week, I found myself gravitating towards the oldest bottle I could find that I could definitively date, rather than the one with the darkest color I could find. In retrospect, some of the listings with the darker color were quite a bit less expensive (though they *were* 1/3 fl oz instead of 1/2 fl oz…), and probably did date to the 60s or so, and so maybe I should have gone with one of those. Ah well, too late now! Thank you for your perspective, btw! Do you or any of your readers know if/when the bottles came with no etching on the base whatsoever? I just bought a 2/3 oz bottle and the picture didnt show any visible etching, but there was a red&blue sticker on the base with the Belgique designation. The juice looked deep and syrupy. I took a chance and bought it because it was a reasonable price considering the bottle is half full. From what I’ve read, all the bottles apparently came with marks from the start since each of the crystal or glass manufacturers put their symbol on it. If there is no visible etching on your bottle, it’s probably faded beyond easy visibility and the eBay seller didn’t photograph it well. My point is, lack of visible markings on the bottom of your bottle is probably a fading issue and the eBay seller is highly unlikely to have taken the time to photograph the base in a way that would highlight any faint markings. When you receive your bottle, you may want to see what camera close-ups reveal. BTW, congratulations on what sounds like a great bottle! Hurrah for “Belgique” stickers! I can’t wait to hear what you think of it when you receive it. 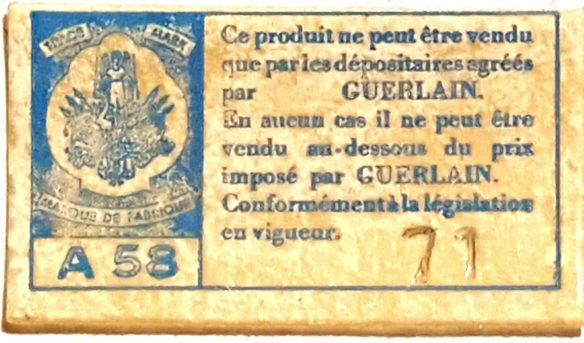 https://raidersofthelostscent.blogspot.it/2016/11/guerlain-stickers.html Yup, the red and blue sticker with the Belgique designation implies 1930s until the end of the 1940s. Wow!! Mind if I ask how much you got it for? $ 89.99 – The bottle looks half full but probably less than that given the top is wider than the bottom. I also bought another bottle with very little juice from another seller for 14.99, I figure it was a throw-away investment, about what I would pay for a decant anyway. When I get them I’ll take pictures. Note to Kafka, perhaps we could have a place on your blog to post recent purchases and then crowdsource the age estimates through the comment section. I saw umbrella bottle on eBay -extrait with volume 7ml. In zigzag box and it says on the bottom of the box N 7.623. The box inside looks like white or cream cardboard. Do you know anything about it ? Hi Nataly, if the box is a zigzag one, then the fragrance dates to sometime between 1967 and 1983/1984. I don’t know what the number on the box means. “N” isn’t one of the usual Guerlain letters for their batch codes. “7.623” could be an internal company product code for the Umbrella design, but that is simply a guess. 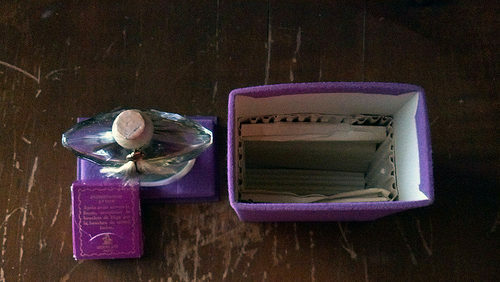 So, all I can tell you is that the box indicates the perfume is from somewhere between 1967 and the early 1980s. It does look like the catalog thinks that should be Mitsouko but again I’ve seen a lot of variances probably given that the factories then where much smaller. One think you can usually count on imo is that if it says 7 after the No it’s 1/4 oz, 15 is 1/2, 40 is 40 mls, etc. Sigh, I should never comment anywhere that doesn’t have an edit or delete button! 623 should be Bouchon Coeurs for everything, not just Mitsouko. Too much turkey. Hahaha, the son/Angela thing is so funny, but perfectly understandable. All parents do that at some point with their kids. Plus, as you said, it’s post-Turkey Day, and that is always when one collapses in exhaustion from all the work and food of the previous day. Did you have a good Thanksgiving, my dear? On my end, I think I surpassed myself this year with my stuffing and my cranberry sauce. Granted, the latter had enough booze and wine in it to kill a hound dog, but still… it was damn good, even if I do say so myself. LOL. I love all your reviews and all your in depth research on bottle makers and dating of Guerlain. I also have been on a quest for a few years. I have a picture of a Cristal Romesnil Shalimar bottle that I sold last year, almost to the day. There was some drama with that sale and I wish I hadn’t sold it. I had no idea how much it would be worth to me at that time. I was really focused on Baccarat at that time. I am not able to copy the photos from my original listing so I hope you can get to it from this link. 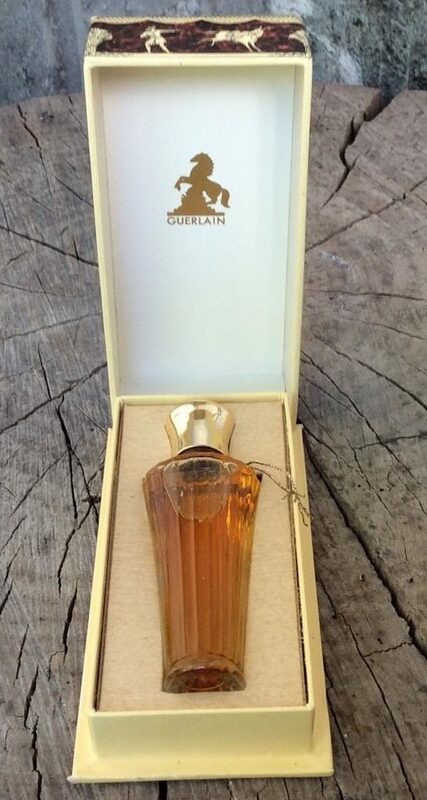 Since the time I originally listed it, I have learned so much more about Guerlain Vintage. If you are able to get the picture of the base from the link, you will now have the elusive Cristal Romesnil acid etched logo photo. I had read at that time they stopped making Shalimar bottles by 1930 but I am not so sure that is accurate. Anyway. Here is evidence those bottles exist. Dear Starletfume, it’s so nice to see you here. Thank you for the kind words on the reviews, but also for the link. I haven’t been near a computer to reply before now, so I hope you’ll forgive my late reply. With regard to the link, attempts to pull up the photo or listing on my phone didn’t work unfortunately as it only gave me a page to set up /open an Etsy account. I finally got near a computer and did a manual Google search for that listing by number and saw the photo. Thank you for all of your hard work and research! I picked up a bottle of Shalimar for free at a garage sale, but the blue umbrella top is made of plastic. There is a clear sticker on the bottom that says 1 oz, 75008, Made in Paris.The sticker on the side is blue and gold and in excellent shape. The juice is quite yellow. I assume this is fairly new bottle. Do you know which decade they produced this bottle with the plastic top? Or could this bottle be an imitation? I’m​ afraid I couldn’t venture a guess about the decade without seeing the bottle. I’m a bit confused by what you mean about the sticker being on the side (of the bottle?? ), and I also don’t know what concentration you’re talking about. The plastic top may indicate a 1990s-onwards eau de toilette, but without a photo or more information on the bottle and concentration, I can’t venture a guess sight unseen. If the paper sticker does not resemble any of the ones shown here and if there is a bar code on the clear sticker on the base of the bottle, then you can look up the number on the Raider’s site to get an idea of the decade. Hope that helps. Also, you may want to check Part II of this series to see if your bottle, its shape, and its design resemble my 1990s EDT bottle shown there (with the blue plastic cap). I THINK it might also be an Avion presentation (more on that below), but, based on the “stamp sticker,” it is definitely from between 1960 and 1967. I’m quite excited for it to arrive!!! It’s also a little confusing to look at the “stamp stickers” on the bottles that are definitely Avion. Yours seems to be monochrome with both a letter and Arabic numerals, while the sticker in the link above is red and blue with Roman numerals in the bottom left. Mine has a sticker that is monochrome with only Arabic numerals (although the only indication that I have that mine is Avion is the white “wrist-band” and I don’t know if that is a reliable indicator). (as well as your own bottles in your posts and the links for the bottles above). I don’t know for sure that this is a hard and fast rule, but I for all the bottles I could definitely date by stamp sticker or box design, I found no counter-examples in my searching. Thanks again for leading me on this truly fascinating journey. I can’t wait until my Marly box and bottle arrive!!! Hi Jondedo, welcome to the blog. I’m glad I got you hooked and that you’ve spent some time mastering this crazy field of vintage Shalimar. With regard to the white cotton band, I’m sorry to say that it’s not at all exclusive to the Avion bottle. I have it for one of my L’Heure Bleue vintage parfums and for one of my Mitsoukos. My mother has it for one of her Mitsouko’s too. The two tell-tale signs of an Avion bottle are the cork and/or, if that’s been discarded in favour of the traditional glass stopper, then the accompanying small purple carton that is shown in your second link. That is unquestionably an Avion bottle. I’m afraid there is nothing to indicate that the one you bought is an Avion bottle but, honestly, it really doesn’t matter so long as one gets a really aged juice in a Marly box — which you did. With regard to the dolphin label, I completely agree that the visuals were smoother, cleaner, more uniform, and more pristine in earlier bottles, especially with regard to the black trim. I’ve used that visual differentiation to help me separate late 1970s/turn of the cusp 1980s bottles from those with that fat, stocky, chunky stems in just in the first few years of the 1980s. I hadn’t noticed the Dolphin label appearance as being so different in its trim, trim width, borders, and edges prior to the late 1970s, let alone the pre-1967 era, but perhaps I simply didn’t look closely enough. It’s must be a very subtle thing, although the difference is pretty blatant in the late 1979/early 1980-1982 chunky, fat stemmed bottles. I’ll keep an eye out from now on to see what I notice with the pre-1967 borders. Thank you for bringing this point or possibility to my attention. One thing I have to say before I finish, I think you got a great bottle. The colour of the juice in the photos is a lovely shade of light mahogany. And that bodes really, really well. (Obviously, the sticker does too.) I don’t know how familiar you are with the travesty that is current Shalimar but I sent samples of the vintage juice in various concentrations to a perfumer friend who is a Shalimar fiend but who has never tried the old stuff. She was blown away by the fact that one of my 1950s EDTs was more complex, smoother, more nuancd, stronger, richer, more powerful, and with greater sillage than her 2015 extrait. And she said her eyes literally rolled back in their head at my Avion bottle extrait. Even her daughter who isn’t into fragrance or scent was blown away, saying it was the epitome of her ideal fragrance and simply astonishing. My point is, if you’ve never tried a really old version but you love vintage scents generally, then you’re in for a treat with your bottle. Avion or no Avion, all that matters is old age and the colour of the juice. You’ve got both in your bottle. I really hope you’ll come back to let me know what you think once you’ve tried it. I don’t know your taste and note preferences, the sorts of things you love or dislike, but I would love to know how you think it compares to other vintage fragrances that you’ve tried. Have a lovely weekend, and welcome again to the blog. Thank you so much for this wonderful series! After reading and re-reading and searching, it was only with your help I was ale to find a rich, deep smelling bottle of my own. I would have fallen into most of the traps and ened up with something much newer otherwise. First, welcome to the blog, Anna. Second, I’m so glad that I could help, and a big hurrah for you finding a good bottle. I hope you love it as much as I do mine. Dear Kafka I would like to ask you a question ,have you weighed your 4,2oz shalimar ? Hi Kafka , may i send you some pics of a old bottle still in package possibly unopened that i have. It has the Baccarat etching and a pg etched on the bottom w/ red & blue sticker. Thank you . It sounds to me like it actually *is* a factice or dummy display bottle. I’ve seen a number of old vintage Guerlain factice bottles that have some sort of “dummy” sticker in the back or on the bottom. In the case of your bottle, perhaps such a sticker fell off so that someone resorted to hand scratching in the words, either as a reminder to separate the bottle from the real thing or as a warning to future buyers. Whatever the reasoning or cause, I highly doubt any owner would defile a bottle of genuine, authentic perfume with a “dummy” marking unless it actually *WAS* a display/dummy bottle filled with non-perfume. There would be little impetus for someone to try to pass off expensive real perfume as a factice because factices are hardly valuable as compared to the real thing. As Laura stated up above, trying to pass off the real thing as a dummy fake would be the reverse of the usual process. Brenda, obviously I am not Kafka but I am a 60 year old woman who has been in love with and collecting perfume – especially Shalimar – since my late teens when I kept house for a wealthy perfumista. The scratched Dummy was very, very common and yes, it meant it was a display only/factice flacon. Over the decades I’ve seen many try to pass dummies off as real perfume…I’ve never seen the reverse though it’s probably happened somewhere. There is a market for factices so if you think of selling it I would suggest going in that direction. Laura/Lady May, thank you so much for jumping in and for being so helpful. I share your interpretation and take on the factice situation.